It's the epidemic we whisper about. About the honor student whose focus turned from their future to their next fix. About the family whose house turned from a safe haven to a house of lies and suspician when drugs came through the door. About the long lost friend whose overdose turned their Facebook page into a memorial. America's addiction to opioids is playing out right down the street, sometimes right down the hall. In its grip, every type of person you can imagine. Successful people, funny people, moms, dads, grandparents, injured athletes, cancer patients, war veterans. Chances are greater than ever you know someone directly affected. With empathy we ask questions with no easy answers. Why are opioids so hard to quit? 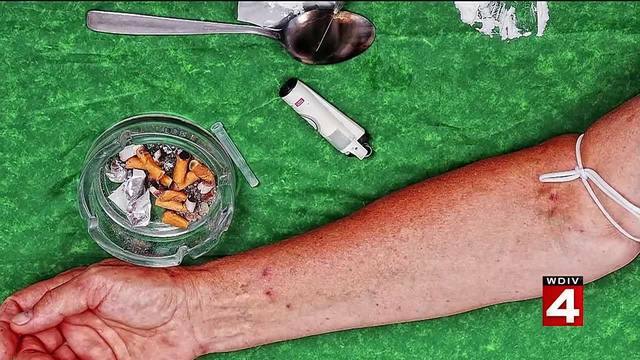 Where can addicts and their loved ones turn for help? What responsibilities do doctors have? Are elected leaders paying more than lip service? 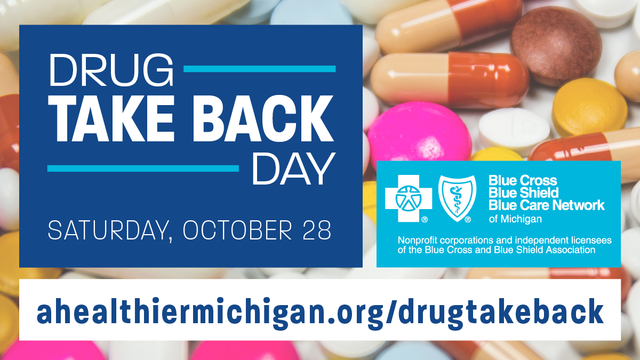 How can we stop the flow of these drugs into our communities? Opioid Nation: An American Epidemic is a look at the people at the front lines of the epidemic. Addicts. Their families. Doctors. Lawmakers. Border patrol agents. Even a former dealer. It is time to stop whispering, because in a nation hooked on opioids, "just say no," is just not that simple. Opioid Nation isn't about numbers, it's about people. But there is one figure that jumps out and puts this crisis into perspective. Back in 2005, 15,000 Americans died of an opioid overdose. In 2015, 33,000. For the first time in our nation's history, heroin is killing more people than guns. But the death toll itself doesn't tell half the story. We don't have the numbers on the lost jobs, the broken marriages, the children who've been sent into foster care by this crisis. There is a lot of ground to cover on this. Let's begin with a look at how we became, Opioid Nation. Michael DeLeon's addiction to drugs did more than ravage his own life. It killed his mother. "My 63-year-old mother was strangled and killed on mothers day and I'm 100% responsible for that," said DeLeon, founder and CEO of Steered Straight, a nonprofit organization that educates children about the dangers of drugs. "I brought this mess into her life. I stand before you as a person who has to live with that fact for the rest of his life." DeLeon turned his life around and now dedicates his life to helping others to the same with is nonprofit Steered Straight. Once upon a time, our view of the opioid problem was largely confined to street junkies trapped in a heroin web of their own making. Hollow eyes and needle-marked arms tucked away in sordid drug houses, headed for deaths that would be just as hidden as their lives. But no longer. "When I talk about it with people they had no idea that there is heroin in Macomb County. Or, I can't imagine my child doing that," said Katie Donovan, who's daughter was a heroin addict. She asked to keep her last name private. "Guess what? I thought the same thing." John Mattarella, the father of a recovering opioid addict, did just about everything right as a parent. "I come from a typical All-American family. Not divorced, no strife in the family, was a soccer coach, went to church, did all the right things we had dinner, we read to our children, all those things," he said. "My son became an opioid addict." Opioid addiction has traded addresses, from that hidden drug house to an enormous home on Main Street. But how in the world did we get here? Unlike the images we've long been fed of alcohol and tobacco having a kind of glamour, in films like "Trainspotting" with Ewan MacGregor searching the worst toilet in Scotland for his suppository of heroin, there has never been anything glamorous or appealing about the Big H. And legions of Americans who could never imagine themselves plunging a needle into their arm have shocked themselves by their ability -- nay -- their hunger to do just that. Now, no doubt, many heroin users follow the old path of seeking a bigger and better high after starting with other drugs, but for so many, the gateway isn't in an alley, it's in healthcare. Pain management is an enormous issue for far too many Americans. There are now entire clinics devoted solely to easing pain. A study from 2015 found that one out of every three Americans took an opioid for pain management. One out of three. That's almost 92 million Americans using drugs like Oxycontin and Vicodin. And drug overdoses now claim more American lives than car crashes. 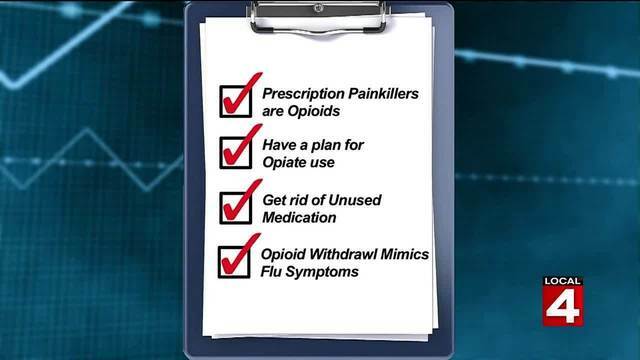 Consider in 2012, there were 259 million prescriptions written for opioids. That's enough for every American adult to get a bottle of opioid pills. If you didn't take any, don't worry. It means there are two for someone else. But we ignore such signs. It's not strictly an American problem, but it is awfully red, white and blue. Americans consume 80 percent of the world's opioid supply. Poor and unemployed people are at particular risk of falling into the opioid abyss, and those are communities with higher rates of arthritis and diabetes. Some believe it's proof of the need for better healthcare options for the poor. But others point out that with patients rich or poor doctors have become far too comfortable sending them home with these powerful, addictive drugs. But a lot of this is on us, isn't it? Maybe our ancestors were willing to bite down on a bullet to get through an amputation, but whether it's agonizing chronic back pain or having a wisdom tooth out, a lot of people don't really want to tolerate pain. From opioids are still overprescribed by doctors and yet crazy stories abound of doctors like Reegan Nichols who is charged with second degree murder, accused of prescribing 1,800 opioid pills in a single month, leading to five fatal overdoses. Those are outlier cases -- but even well-meaning physicians have been criticized for not managing their patients prescription ebbs and flows. "I can show you a text book, in fact I've been to conferences 10 years ago, they used to tell primary care doctors, all physicians, that there was no limit on opioids, that if you get tolerant you just keep going up," said Dr. David Kim, a pain specialist at Henry Ford Hospital. "And I look at that now and i say how stupid were we?" With a new focus on the crisis, opioid prescriptions are down. But in one out of every five counties in the U.S., opioid use is still on the rise. And for too long, the silence has been deafening. "The truth is this epidemic spread because of silence no one was talking about it, no one dared talk about it," said Sam Quinones, author of "Dream Land: The True Tale of America's Opiate Epidemic." "Parents who had addictive kids were mortified and ashamed even when they died they wouldn't talk about it that much and that's why we have it coast to coast as well."